"Balding" redirects here. For the surname, see Balding (surname). "Alopecia" redirects here. For the album, see Alopecia (album). Hair loss on a man. Loss of hair from part of the head or body. Treatment of pattern hair loss may simply involve accepting the condition. Interventions that can be tried include the medications minoxidil (or finasteride) and hair transplant surgery. Alopecia areata may be treated by steroid injections in the affected area, but these need to be frequently repeated to be effective. Hair loss is a common problem. Pattern hair loss by age 50 affects about half of males and a quarter of females. About 2% of people develop alopecia areata at some point in time. Baldness is the partial or complete lack of hair growth, and part of the wider topic of "hair thinning". The degree and pattern of baldness varies, but its most common cause is androgenic hair loss, alopecia androgenetica, or alopecia seborrheica, with the last term primarily used in Europe. Hypotrichosis is a condition of abnormal hair patterns, predominantly loss or reduction. It occurs, most frequently, by the growth of vellus hair in areas of the body that normally produce terminal hair. Typically, the individual's hair growth is normal after birth, but shortly thereafter the hair is shed and replaced with sparse, abnormal hair growth. The new hair is typically fine, short and brittle, and may lack pigmentation. Baldness may be present by the time the subject is 25 years old. Symptoms of hair loss include hair loss in patches usually in circular patterns, dandruff, skin lesions, and scarring. Alopecia areata (mild – medium level) usually shows in unusual hair loss areas, e.g., eyebrows, backside of the head or above the ears, areas the male pattern baldness usually does not affect. 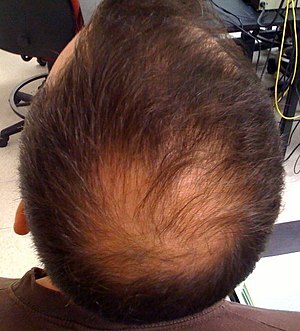 In male-pattern hair loss, loss and thinning begin at the temples and the crown and hair either thins out or falls out. Female-pattern hair loss occurs at the frontal and parietal. People have between 100,000 and 150,000 hairs on their head. The number of strands normally lost in a day varies but on average is 100. In order to maintain a normal volume, hair must be replaced at the same rate at which it is lost. The first signs of hair thinning that people will often notice are more hairs than usual left in the hairbrush after brushing or in the basin after shampooing. Styling can also reveal areas of thinning, such as a wider parting or a thinning crown. Frictional alopecia is hair loss caused by rubbing of the hair or follicles, most infamously around the ankles of men from socks, where even if socks are no longer worn, the hair often will not grow back. Traumas such as childbirth, major surgery, poisoning, and severe stress may cause a hair loss condition known as telogen effluvium, in which a large number of hairs enter the resting phase at the same time, causing shedding and subsequent thinning. The condition also presents as a side effect of chemotherapy – while targeting dividing cancer cells, this treatment also affects hair's growth phase with the result that almost 90% of hairs fall out soon after chemotherapy starts. Hair loss often follows childbirth in the postpartum period without causing baldness. In this situation, the hair is actually thicker during pregnancy owing to increased circulating oestrogens. Approximately three months after giving birth (typically between 2 and 5 months), oestrogen levels drop and hair loss occurs, often particularly noticeably around the hairline and temple area. Hair typically grows back normally and treatment is not indicated. A similar situation occurs in women taking the fertility-stimulating drug clomiphene. An unhealthy scalp environment can play a significant role in hair thinning by contributing to miniaturization or causing damage. Air and water pollutants, environmental toxins, conventional styling products and excessive amounts of sebum have the potential to build up on the scalp.. This debris can block hair follicles and cause their deterioration and consequent miniaturization of hair.. It can also physically restrict hair growth or damage the hair cuticle, leading to hair that is weakened and easily broken off before its natural lifecycle has ended. 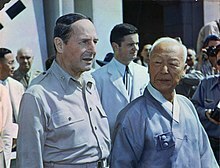 General Douglas MacArthur wearing a "comb over". There is some tentative evidence that anthralin may be useful for treating alopecia areata. French soccer player Zinedine Zidane popularized a shaved head during the 1990s. Dietary supplements are not typically recommended. There is only one small trial of saw palmetto which shows tentative benefit in those with mild to moderate androgenetic alopecia. There is no evidence for biotin. Evidence for most other produces is also insufficient. There was no good evidence for ginkgo, aloe vera, ginseng, bergamot, hibiscus, or sorphora as of 2011. ^ a b "Hair loss". NHS Choices. Archived from the original on 27 September 2013. Retrieved 22 September 2013. ^ a b c d Nalluri, R; Harries, M (February 2016). "Alopecia in general medicine". Clinical Medicine. 16 (1): 74–8. doi:10.7861/clinmedicine.16-1-74. PMC 4954340. PMID 26833522. ^ a b c d e f g h i j k l m n o p q r s Vary JC, Jr (November 2015). "Selected Disorders of Skin Appendages--Acne, Alopecia, Hyperhidrosis". The Medical Clinics of North America. 99 (6): 1195–211. doi:10.1016/j.mcna.2015.07.003. PMID 26476248. ^ a b McElwee, K. J.; Shapiro, J. S. (2012). "Promising therapies for treating and/or preventing androgenic alopecia". Skin Therapy Letter. 17 (6): 1–4. PMID 22735503. Archived from the original on 2015-12-12. ^ a b Leavitt, M. (2008). "Understanding and Management of Female Pattern Alopecia". Facial Plastic Surgery. 24 (4): 414–427. doi:10.1055/s-0028-1102905. PMID 19034818. ^ "Hair loss". DermNet. Archived from the original on 2016. Retrieved 2016-08-03. ^ Dawber, Rodney P. R.; Van Neste, Dominique (2004). Hair and scalp disorders: common presenting signs, differential diagnosis and treatment (2nd ed.). Informa Health Care. pp. 53–54. ISBN 978-1-84184-193-9. ^ Bergler-Czop, B; Brzezińska-Wcisło, L (2004). "Hormonal factors in etiology of common acne". Polski Merkuriusz Lekarski : Organ Polskiego Towarzystwa Lekarskiego. 16 (95): 490–2. PMID 15518435. ^ ‘The psychology of appearance: Why health psychologists should "do looks"’, Nichola Rumsey, September 2008: "Research in the Faculty of Health and Applied Sciences - UWE Bristol: Faculty of Health and Applied Sciences" (PDF). Archived (PDF) from the original on 2012-03-30. Retrieved 2013-09-21. ^ Passchier J, Erdman J, Hammiche F, Erdman R (2006). "Androgenetic alopecia: stress of discovery". Psychol Rep. 98 (1): 226–8. doi:10.2466/PR0.98.1.226-228. PMID 16673981. ^ Poot F (2004). "[Psychological consequences of chronic hair diseases]". Revue Médicale de Bruxelles. 25 (4): A286–8. PMID 15516058. ^ "Drug-Induced Hair Loss". Archived from the original on 2013-08-24. ^ ‘Drug Induced Hair Loss’, American Hair Loss Association: "American Hair Loss Association - Drug Induced Hair Loss". Archived from the original on 2013-09-21. Retrieved 2013-09-21. ^ Pappas P, Kauffman C, Perfect J, Johnson P, McKinsey D, Bamberger D, Hamill R, Sharkey P, Chapman S, Sobel J (1995). "Alopecia associated with fluconazole therapy". Ann Intern Med. 123 (5): 354–7. doi:10.7326/0003-4819-123-5-199509010-00006. PMID 7625624. ^ "Alopecia: Causes". Better Medicine. Archived from the original on 23 March 2012. Retrieved 28 March 2012. ^ "Drug-Induced Hair Loss". Archived from the original on 2013-07-26. ^ Nnoruka E, Nnoruka N (October 2005). "Hair loss: is there a relationship with hair care practices in Nigeria?". Int J Dermatol. 44 (Suppl 1): 13–7. doi:10.1111/j.1365-4632.2005.02801.x. PMID 16187950. ^ "Anagen Effluvium". Archived from the original on 2010-06-16. Retrieved 2010-06-29. ^ SCHIFF, BENCEL L. (1963-05-01). "Study of Postpartum Alopecia". Archives of Dermatology. 87 (5): 609. doi:10.1001/archderm.1963.01590170067011. ISSN 0003-987X. ^ Eastham, John H (February 2001). "Postpartum Alopecia". The Annals of Pharmacotherapy. 35: 255–258. doi:10.1345/1542-6270(2001)035<0255:pa>2.0.co;2. ISSN 1060-0280. ^ "What is Alopecia: What Causes Alopecia?". MedicalBug. 6 February 2012. Archived from the original on 22 January 2013. Retrieved 28 March 2012. ^ a b Yamada, T; Hara, K; Umematsu, H; Kadowaki, T (2013). "Male pattern baldness and its association with coronary heart disease: A meta-analysis". BMJ Open. 3 (4): e002537. doi:10.1136/bmjopen-2012-002537. PMC 3641488. PMID 23554099. ^ Rudnicka L, Olszewska M, Rakowska A, Kowalska-Oledzka E, Slowinska M (2008). "Trichoscopy: a new method for diagnosing hair loss". J Drugs Dermatol. 7 (7): 651–654. PMID 18664157. ^ a b c Banka, N; Bunagan, MJ; Shapiro, J (January 2013). "Pattern hair loss in men: diagnosis and medical treatment". Dermatologic Clinics. 31 (1): 129–40. doi:10.1016/j.det.2012.08.003. PMID 23159182. ^ a b c d e f Rogers, Nicole E.; Avram, Marc R. (Oct 2008). "Medical treatments for male and female pattern hair loss". Journal of the American Academy of Dermatology. 59 (4): 547–566, quiz 567–568. doi:10.1016/j.jaad.2008.07.001. ISSN 1097-6787. PMID 18793935. ^ Shapiro, J (Dec 2013). "Current treatment of alopecia areata". The Journal of Investigative Dermatology. Symposium Proceedings. 16 (1): S42–4. doi:10.1038/jidsymp.2013.14. PMID 24326551. ^ ‘Hair Transplants’, WebMD: "Hair Transplant Procedures: Average Cost, What to Expect, and More". Archived from the original on 2013-09-21. Retrieved 2013-09-21. ^ Grevelman, EG; Breed, WP (March 2005). "Prevention of chemotherapy-induced hair loss by scalp cooling". Annals of Oncology. 16 (3): 352–8. doi:10.1093/annonc/mdi088. PMID 15642703. ^ Breed, WP (January 2004). "What is wrong with the 30-year-old practice of scalp cooling for the prevention of chemotherapy-induced hair loss?". Supportive Care in Cancer. 12 (1): 3–5. doi:10.1007/s00520-003-0551-8. PMID 14615930. ^ Komen, MM; Smorenburg, CH; van den Hurk, CJ; Nortier, JW (2011). "[Scalp cooling for chemotherapy-induced alopecia]". Nederlands Tijdschrift voor Geneeskunde. 155 (45): A3768. PMID 22085565. ^ Benedictus, Leo (February 2, 2013). "The 10 rules for bald men". The Guardian. ISSN 0261-3077. Retrieved December 1, 2018. ^ Rockwell, Taylor (October 16, 2015). "The 20 Greatest Bald Heads in the History of Soccer". pastemagazine.com. Retrieved December 1, 2018. ^ a b Blumeyer, A; Tosti, A; Messenger, A; Reygagne, P; Del Marmol, V; Spuls, PI; Trakatelli, M; Finner, A; Kiesewetter, F; Trüeb, R; Rzany, B; Blume-Peytavi, U; European Dermatology Forum, (EDF) (October 2011). "Evidence-based (S3) guideline for the treatment of androgenetic alopecia in women and in men". Journal of the German Society of Dermatology. 9 Suppl 6: S1–57. doi:10.1111/j.1610-0379.2011.07802.x. PMID 21980982. ^ Panda, H (2004). Handbook on Ayurvedic Medicines with Formulae, Processes and Their Uses. ISBN 9788186623633. Archived from the original on 2016-05-16. ^ Suresh Babu, S (2002-01-01). Home Made Herbal Cosmetics. ISBN 9788122307757. Archived from the original on 2016-06-10. ^ Zhou, Zhongying; Jin, Hui De (1997). Clinical Manual of Chinese Herbal Medicine and Acupuncture. ISBN 978-0-443-05128-9. ^ Rebora A (1 July 2001). "Baldness and coronary artery disease: the dermatologic point of view of a controversial issue". Arch Dermatol. 137 (7): 943–7. PMID 11453815. ^ Lei M, Chuong CM (2016). "STEM CELLS. Aging, alopecia, and stem cells". Science. 351 (6273): 559–60. Bibcode:2016Sci...351..559L. doi:10.1126/science.aaf1635. PMID 26912687. ^ Matsumura H, Mohri Y, Binh NT, Morinaga H, Fukuda M, Ito M, Kurata S, Hoeijmakers J, Nishimura EK (2016). "Hair follicle aging is driven by transepidermal elimination of stem cells via COL17A1 proteolysis". Science. 351 (6273): aad4395. doi:10.1126/science.aad4395. PMID 26912707. ^ Harper, Douglas. "Entry for "bald"". Online Etymology Dictionary. Archived from the original on 2006-05-09. Retrieved 2006-12-07.